Naval Air Station Oceana or NAS Oceana (IATA: NTU, ICAO: KNTU, FAA LID: NTU) is a military airport. It is in Virginia Beach, Virginia. NAS Oceana is a United States Navy "Master Jet Base". It is also known as Apollo Soucek Field. It was named after Lieutenant (later Admiral) Apollo Soucek. He was a Navy test pilot who set the world altitude record in 1930. Soucek flew a Curtiss "Hawk" biplane to an altitude of 43,166 feet. NAS Oceana is the only Master Jet Base on the East Coast. In 1940, the U.S. Navy got the land that would become Naval Air Station Oceana. The nearby area was mostly farmland that flooded easily. It was useful as a second airfield to support the growing Naval Air Force at NAS Norfolk. It also let units get ready for deployments away from the crowded base there. NAS Norfolk could not be the home station for tactical air units because of problems with airspace. Much of its airspace is shared with the Norfolk International Airport. In the 1950s, NAS Oceana was made larger and given Master Jet Base status to be the home for the tactical air units. NAS Oceana has grown to become one of the largest air stations in the world. It covers an area of 6,820 acres (27.6 km2). Area around the base was cleared to remove obstructions and make flight easier at the base. This adds an additional 3,680 acres (14.9 km2) to the area of the base. The bass has four runways. They are laid out in two pair forming a cross. Three of the runways are 8,000 feet (2,400 m) in length. The other is 12,000 feet (3,700 m). They are designed for high-performance aircraft. NAS Oceana's main mission is to train and house the Navy's Atlantic Fleet strike fighter squadrons of F/A-18 Hornets and Super Hornets. Naval Aviators and Naval Flight Officers at NAS Oceana fly about 219,000 training operations each year. On a Navy Master Jet Base, all aircraft at one base are usually of the same Type/Model/Series (T/M/S). That airfield also has the maintenance and training facilities for that type of aircraft. NAS Oceana had two types normally. It had a fighter and Attack aircraft section. 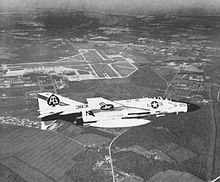 In the 1960s, NAS Oceana became the home to all East Coast based F-4 Phantom II squadrons. Fighter Squadron 101 (VF-101) created a detachment at NAS Oceana. It served as the "Fleet Readiness Squadron" (FRS). It trained pilots and other crew members to operate the Phantom. It also trained the people who repaired the aircraft. After the F-14 Tomcat began being used in 1976, VF-101 changed to using and training people to use Tomcats. Phantom training operations moved to Fighter Squadron 171 (VF-171). VF-171 dealt with Atlantic Fleet training for the F-4 Phantom until it was no longer used in 1984. The last F-14 was retired on 22 September 2006. At one time, all of the Atlantic Fleet's A-6 Intruder attack squadrons were also home-based at NAS Oceana. VA-42 was the Fleet Readiness Squadron that trained all east coast A-6 pilots, bombardier/navigators and A-6 maintenance personnel. The A-6E was no longer used in the Fleet in 1997. NAS Oceana became home to the F/A-18 Hornet in 1999 after NAS Cecil Field, Florida was closed. NAS Oceana is home to seventeen strike fighter squadrons of F/A-18 Hornets and F/A-18 Super Hornets. The base is the only East Coast Master Jet Base. It is home to all the east coast strike-fighter (VFA) units except VFA-86 and Marine Corps VMFA squadrons. VFA-106 Gladiators are in charge of training. They use F/A-18C/D Hornets and F/A-18E/F Super Hornets. Tomcat training was done by the VF-101 "Grim Reapers". NAS Oceana was host to the "Tomcat Sunset" reunion from 21–23 September 2006. Over 3000 former and current aircrew and maintainers came together to celebrate the retirement of the F-14 from active use. NAS Oceana was where the F-14 took off for the last time for final flight. The F-14D, Bureau Number (BuNo) 164603, Modex 101, of Fighter Squadron31 (VF-31) was flew from NAS Oceana to Calverton on Long Island, NY. It was put on display at the Northrop Grumman facilities where the Tomcat was first built. During the 2005 BRAC base closures, it was decided that NAS Oceana could stay open only if some conditions were met. The largest problem was that the city of Virginia Beach had to buy and destroy about 3,400 houses and an unknown number of businesses near the base. These buildings were in the "Crash zone", the area most likely to be the site of an accident on landing. The fighters would likely have been moved to NAS Cecil Field near Jacksonville, Florida if NAS Oceana was not able to meet the conditions. The plan was well liked by Jacksonville Mayor John Peyton. The Navy decided it did not like the idea of moving the Master Jet Base to the Jacksonville area. On 20 December 2005 the Virginia Beach passed many ordinances to do what BRAC wanted, but did not destroy any of the homes. NAS Oceana has been an possible landing site for NASA's Space Shuttle if needed. Fleet Readiness Center (FRC) Mid-Atlantic (was the Aviation Intermediate Maintenance Department (AIMD) Oceana). One of six centers for naval aviation maintenance, FRC provides Intermediate and Depot level maintenance to the squadrons. It also provides "SeaOpDet (Sea Operations Detachment) technicians to aircraft carriers on the East Coast while deployed. Strike Fighter Wing Atlantic, the command in charge of all east coast Hornet and Super Hornet squadrons when not deployed with their respective carrier air wings. Strike Fighter Weapons School, Atlantic (SFWSL) a Weapons School staffed by Strike Fighter Weapons & Tactics (SFWTI) instructors. F/A-18 aircrews go here for "graduate level" or advanced training in air-to-ground ordnance delivery and air-to-air tactics. Landing Signal Officer School (LSO School), where pilots chosen to be LSOs go to learn how to "wave" planes aboard the "boat" (aircrew speak "land on the aircraft carrier"). CVW commands, or Carrier Air Wing Commanders (also called CAG, which is from the older name for these commands, Carrier Air Groups) are responsible for all squadrons in an air wing when on board a carrier or when preparing for overseas deployment. Carrier Air Wings ONE, THREE, SEVEN, EIGHT, and SEVENTEEN have headquarters at NAS Oceana. Strike Fighter Composite Squadron 12 (VFC-12), a Navy Reserve F/A-18C Hornet squadron that help train Atlantic Fleet strike fighter squadrons by acting as enemy aircraft. Fleet Logistics Support Squadron 56 (VR-56), a Navy Reserve C-9 Skytrain II squadron that provides transportation for U.S. Navy Fleet units and shore commands. Fleet Area Control and Surveillance Facility Virginia Capes (FACSFAC VACAPES, callsign GIANT KILLER), which is responsible for surveillance, management and sea and air traffic control of the Virginia Capes warning areas for training purposes, as well as surveillance duties in support of Homeland Defense. Construction Battalion Unit 415 (CBU 415), a Navy Seabee Battalion. Center for Naval Aviation Technical Training Unit Oceana (CNATTU Oceana), which trains Navy and Marine Corps aircraft maintainers on the F/A-18. Marine Aviation Training Support Group 33, a United States Marine Corps training administration command. A branch Medical and Dental clinic under the command of Naval Medical Center Portsmouth, VA.
Wikimedia Commons has media related to Naval Air Station Oceana. This page was last changed on 31 October 2018, at 06:54.